Will my app store listing convert well? First click testing allows you to experiment with alternatives of your listing to find out which icons, app names, prices, and taglines perform best in amongst competing apps. 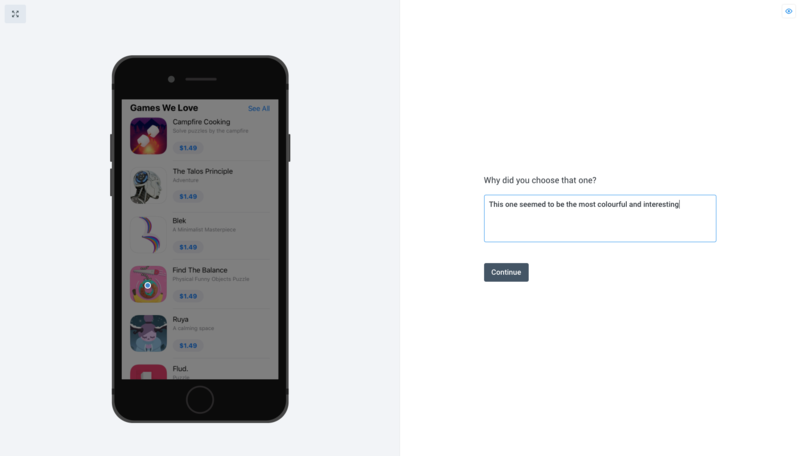 Using a first click test enables you to start optimizing your app listing before going live on the app store. You can check how an icon, name, or price might perform before taking the plunge in the marketplace. When setting up a first click test with multiple options, be sure to use a variation set to ensure that each test has a unique set of participants. Only change the app listing itself, leaving its position, the rest of the image, and the phrasing of instructions and questions constant across all of your variations. Test your listing against the real listings for your target search phrase. This will give you an idea about how your listing performs compared to currently high performing listings. As with many tests that measure audience preferences, be sure to ask some questions up front so that you have an idea about the existing preferences of people submitting responses to your test. Similarly, asking ‘Why did you choose this option?’ at the end of the test will give you an insight into what is (or isn’t) working. The results here should be easy to interpret — just remember to look closely at each of the text responses, to make sure you’re not missing a nugget of priceless insight about your audience.